I always look forward to new stamps issued by the US Postal Service. My favorite times to seek out new stamps are in November for Christmas and then in January for the Chinese Lunar New Year. I’ve been known to buy a whole sheet of them and then not even use them on envelopes as they’re so interesting as a group. The year I signed a contract with a publisher to translate and publishing “Beyond the Rainbow Bridge” I sent a framed sheet of the US stamps as a holiday gift. This year’s stamp was designed by Brooklyn artist, Kam Mak. The following information is provided by the US Postal Service. “The Lunar New Year is celebrated primarily by people of Chinese, Korean, Vietnamese, Tibetan and Mongolian heritage in many parts of the world. In the United States, as elsewhere, the occasion is marked with parades, parties and other special events. Drums, such as those depicted in the stamp art, are played to celebrate this time of renewed hope for the future, with drumsticks sometimes painted red for luck. Monetary gifts are given to children and others. Lucky foods are eaten and festive lanterns are hung as decorations. People born in the Year of the Horse are said to be easygoing intelligent individuals who are willing to work hard. The U.S. 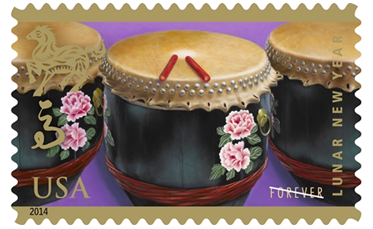 Postal Service originally introduced a 12-year Lunar New Year stamp series in 1993 depicting the artwork of Clarence Lee. In 2008, the series resumed with the work of Kam Mak’s Year of the Rat stamp. The series will continue through 2019 with stamps for the Year of the Ram, Monkey, Rooster, Dog and Boar. This limited edition stamp is being issued in plenty of time for customers to mail new year’s greetings. Lunar New Year begins Jan. 31, 2014 and ends Feb. 18, 2015. Although my children are adults and out in the world, I’ve continued our family observance of an Advent wreath in December. Some years I have used four candlesticks and other years I’ve used a ring—a circular base with four built-in holders for the candles. My latest Advent wreath is a blue ceramic ring. 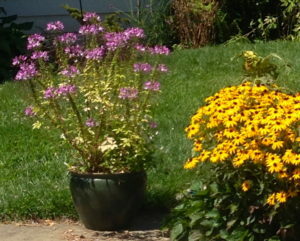 Since it can hold water, I use it during other seasons with flowers and greens from my gardens. This December I have placed it in my kitchen window so I can look at it when I prepare meals. I light it when I’m fixing dinner. On Christmas Eve I will transfer it to our dining room table. Click on the photograph to the left if you’d like to see an enlarged view. After lighting the appropriate number of candles, the first week I added stones, shells, an animal bone, and minerals. This 2nd week I’ve already added holly and greens from our gardens. Next week I will include small wooden animals, particularly sheep and a camel from my creche scenery. Wooden figures representing human beings will be added the final week. I usually use my creche figures representing Joseph, Mary, and a shepherd. I keep the scene for Christmas Day and add a white candle in the center and my small manger with the tiny baby. Over the years, I’ve passed these ideas on to family, friends and neighbors. 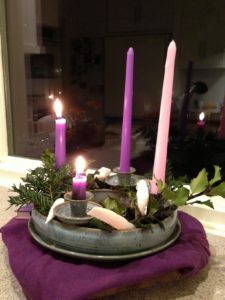 Let me know how YOU celebrate Advent—and send me photos, too. This photo only shows our wreath at Week 2. Halloween is the one festival with perhaps more ancient beginnings than any other holiday. Few of these origins are known commonly with the result that for many, Halloween has lost any serious meaning. A look at its origins might help us place this festival in perspective both in our hearts and in our calendars. The celebration that was to become Halloween began with the Druids in Britain and Brittany, France. Two principal feast days for the Druids were the spring festival of Beltane on May 1st and the autumn festival of Sahain on November 1st. The night before Samhain, October 31st, was the most feared evening of the year. On this night beginning at midnight and lasting through the following day, celebrations were held to placate Samhain, the Lord of Death. During the night Samhain allowed the spirits of those who had died within the last 12 months to roam the earth. To frighten the evil spirits away, huge bonfires were lit on hilltops in honor of the sun god. November 1st marked summer’s end and the beginning of a new year. In Ireland, new fires were kindled from fires which had been started by Druid priests rubbing pieces of oak together. The new fires in each hearth would last until next November 1st. When the Romans conquered Britain, they added to the Druid feast of Samhain their own feast, honoring Pomona, the goddess of fruits and the feast of Februalia, the festival of the dead. The month of February was later dedicated to this god. In 900, the Christians moved their celebration of All Saints from May to November 1st. This feast of all the holy ones (All Hallows) was preceded by All Hallows’ Even, later to be called Halloween. In the 10th century, the day after All Saints Day was designated as the Feast of All Souls, in which all the dead were remembered. Their close presence was felt at this time. But as many spirits good and bad shared this moment, the people were cautious. “On November Eve there is a bogy on every style” warned a Welsh proverb. For protection from evil spirits, some people carried sprigs of the magic rowan tree. Others kept salt and iron with them, two substances which frightened fairies and evil spirits. Masks kept the ghosts at bay and made it difficult for them to recognize the wearer. Nuts and apples, tokens of the winter store of fruit were roasted on the great bonfires. Several days beforehand, young boys went around begging for material for the fires. Masked adults often visited homes begging for food. Sometimes the food was meant for the dead as with the soul cakes in Scotland. Great tables were spread both as a celebration for the harvest and to feed the dead. Charms, spells and predictions were believed to have more power on the eve of Samhain. The usual performers were called witches after the Saxon word “wica” meaning “wise one.” Several times a year, witches from all over gathered at a sacred spot. One important date was April 30th, the eve of May, a day sacred to the mating of animals. Halloween was another important date and it recalled the hunting of animals by men. Witches were often depicted with black cats. Stealthy animals whose glowing eyes could see in the night, the cats were considered to be supernatural beings as far back as Egypt. Hecate, the Greek goddess who ruled over witches, wizards and ghosts, had a priestess who was a cat. To the Druids, cats were dreaded as human beings who had been changed into animals by evil powers. On Halloween, a number of cats were always thrown into the Samhain fires. Part of the Samhain fire is recalled in the Jack-O-Lantern. 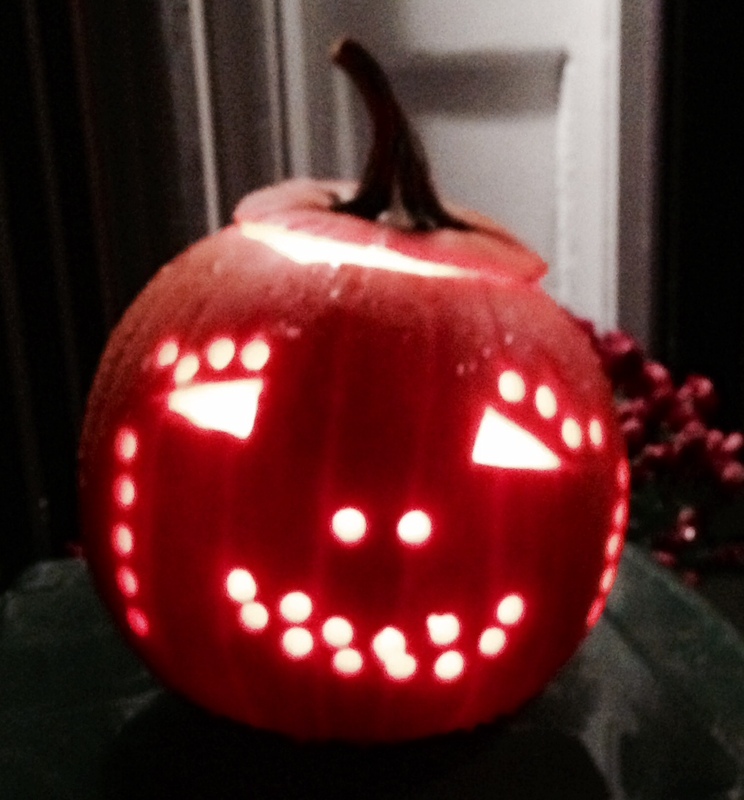 Some say the Jack-O-Lantern originated with a fellow named stingy Jack who broke his pact with the devil. As a consequence the evil forced him to roam the face of the earth carrying a glowing coat from hell in a carved out turnip. Pumpkins later replaced turnips and their orange color became a necessary hue at Halloween along with the black of night and death. In tracing the origin of Halloween we recognize the source of much that has become the custom at this time of year and why children don masks and costumes, carve pumpkins and go from door to door begging for food. Pranks are played and everyone experiences the eerie quality this festival evokes. We are courting death, that mystery-enshrouded event which continuously reminds us of our dual citizenship; here and in the spiritual worlds. Every religion and every culture sets aside at least one time every year to remember and commune with the dead. to warn everybody that summertime cannot last forever. the crickets spread the rumor of sadness and change. I’m starting this entry in mid-August outdoors in my garden. Here in New England, the hot and humid weather of July has given way to cool nights and mornings and the 70s during the day. It’s a welcome relief. One of the pleasures of working at home is the option of abandoning my keyboard and computer, and sitting on the patio with pen and paper. No longer do I seek the shade under our magnificent birch tree — I can just don my hat and enjoy the sunshine. I’ve even given up weeding my perennial beds. I figure that if any plant is green, I’ll just let it stay and take care of it later when I begin my autumn cleanup. As I gaze on the Black-Eyed Susans, Autumn Joy, Yellow Marigolds, White Balloon Flower, Cleome, Red Geraniums and cherry tomato plants, I’ve decided to write about a nature book. 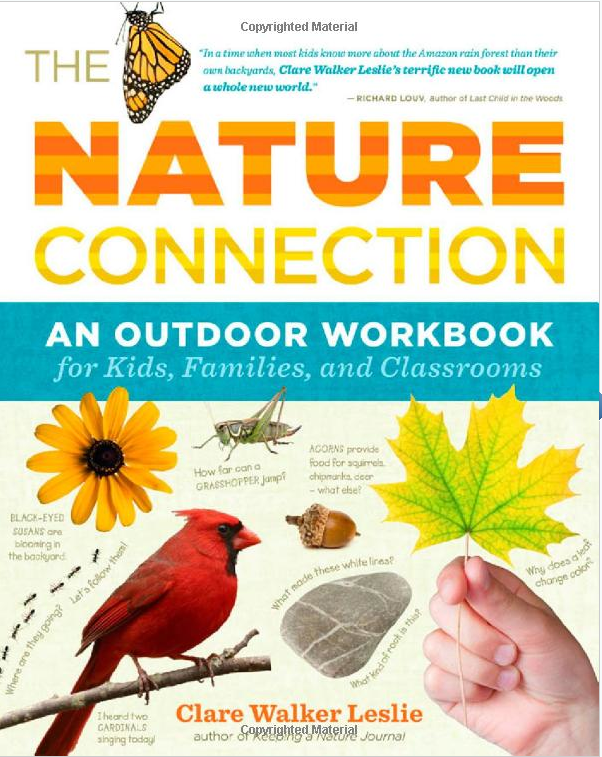 It is one of those serendipitous “gems” I promised to write more about—The Nature Connection: An Outdoor Workbook for Kids, Families, and Classrooms by Clair Walker Leslie. I met Clare at the annual New England Independent Bookseller’s Association (NEIBA) in Providence, RI. She was signing and giving out copies of her book as part of the Authors’ Night held the evening before the conference. I always look forward to meeting authors and seeing which books are just pre-pub galleys or ones about to hit the bookstore shelves. This book cover was bright and pleasing, the subject was of interest to me, and her publisher was Storey Publishing of North Adams, MA, a publisher I follow. Fortunately for me, there wasn’t a long line of other attendees waiting to see her book at that moment and I had a chance to talk with her at some length. As soon as I picked up the book and perused its pages, I knew it would be a wonderful resource to help children to connect to each other and the Earth. Even adults who have read Richard Louv’s book, Last Child in the Woods, and know their children ought to go outdoors more frequently often need some inspiration and ideas to begin any kind of nature study. If so, start with this book. It is just the right size for taking on a walk or tucking into a backpack and its design is practical and attractive. It’s divided into twelve months with learning ideas for each one. Our summer may we winding down here in the northern hemisphere, but you can start anywhere in the year. Just open the front door, take this book, and go outdoors. You’ll find an adventure right in your neighborhood. Clare looks beyond nature study, integrating many other subjects—math, language arts, other sciences—and provides activities for diverse conditions. It doesn’t matter if you live in an urban setting, small town or out in the country—there’s so much you can see, do and have fun learning. 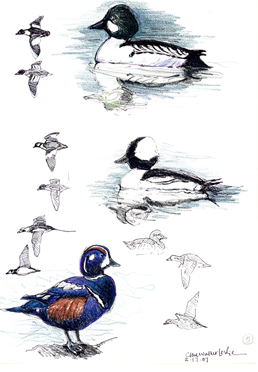 The book’s design is also enhanced with Clare’s nature sketches. I learned from her that she didn’t grow up intending to be naturalist nor an artist nor even an author. But she loved to play in the woods and fields near her home outside Philadelphia and with more study, she became a self-taught naturalist. After obtaining a B.A. 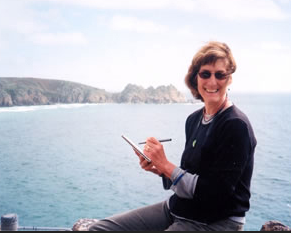 in Art History from Carleton, she combined her love of nature studies with drawing, painting, teaching and now writing. 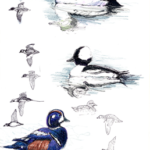 Having kept a nature journal since 1978 to keep track of seasonal changes over the years, Clare includes plenty of easy-to-use Journal Worksheets in the book with more to download from Storey’s website. Clare is a warm, engaging woman with so much love and curiosity for the world around us. It’s easy for me to be passionate about The Nature Connection and want to tell others about it. This is her 11th book and her other titles may delight you as well. A note about Storey: They are one of my favorite publishers and I have followed their success for years and particularly under the leadership of Pam Art. I’ll probably write a separate blog about them some day, but please go to their website to see the diversity and breadth of their titles. Make sure you look for their books when you visit your local independent bookstore. Today—during these last weeks of summer—I’m finally starting a new series of blogs about some of the books and authors Karen Latimer and I chose to include in our Make Way for Reading: Great Books for Kindergarten Through Grade 8. My intention is to do this weekly, but I may be inspired and write this more often. As expected, Karen and I discovered all sorts of marvelous titles—separately and together—as we developed the book. Not only did we review our own personal lists we’d been maintaining for years along with lists from schools, libraries, and the suggestions readers sent me after I published Waldorf Student Reading List, but also we visited bookstores and talked with librarians. Being a publisher already, I also attended many book trade shows—local, regional and national—meeting other publishers (some micro-independents and others mega-size) along with authors and illustrators. Karen and I both delighted in discovering a book “by chance” — via some serendipitous route. These often became some of the “gems” in our lists. However, writing concise annotations often proved challenging. Sometimes each of us had a personal connection to a title and had to fight that all-too-frequent pull to tell the reader more than our book project’s space allowed. We give an EXTRA “Enrollment Discount” to the many schools which provide one or more of our titles to: Newly-enrolling families, Parent/child class, Grade 8, etc. 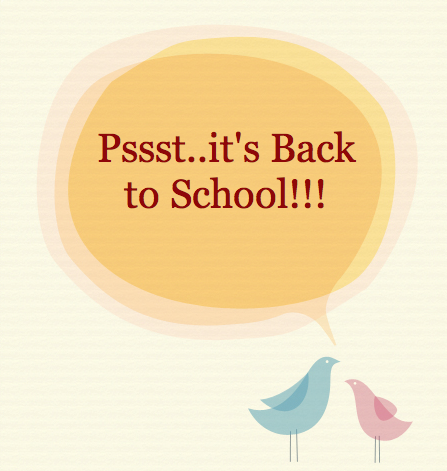 Click on Back-to-SchoolDiscount2013 to view the discounts. Please call us directly to place your order: +978-388-7066. Leave a message if we’re unavailable. For 22+ years, Michaelmas Press has been providing books on parenting, children’s literature, and Waldorf education. A month prior to becoming Director of Community Development at the Waldorf School of Princeton (NJ) in 1993, my husband, youngest daughter, and I flew to Princeton to meet the faculty, visit the surrounding towns, and rent a place which would be our new home. It was an exciting time for us all. I had completed my 3-year Waldorf Teacher Education program and graduated from Rudolf Steiner College and our daughter had graduated from the 8th grade at Marin Waldorf School. Our move from California to New Jersey would be an adventure for us all. At the end of our visit, we attended the school’s annual Solstice/St. John’s Day celebration. It was held in a clearing on the 12-acre main campus (formerly a farm.) At dusk families, teachers, and friends associated with the school arrived and walked down the path gathering around the bonfire. The pile of wood had taken shape over several days and gained in height by June 24th. We were looking forward to seeing how this event would be celebrated. We also recognized that this event wasn’t just a fun way to commemorate the longest day of the year and the start of summer. It really meant leaving one community on the west coast and joining a new one on the east, the start of a new career path, and a new beginning for us as a family. I had loved bonfires as a child, but didn’t see them often. The neighborhood where I grew up always had a bonfire the night before the 4th of July. It was a huge tower and its frame was usually constructed of railroad ties. The insides had logs, old wooden boxes, and other scrap wood. It was a night we children could certainly stay up late—the bonfire would be lit around 9 or maybe later. Around that time children were directed to stop their play and to join their parents up on the adjoining hill—two or three men then would pour kerosene on the lower logs of its base. I can still remember the suspense waiting for a burning stick to be thrown onto the pile. Everyone cheered with the resulting roar—it was certainly the start of summer for me! I felt that same jiggly tummy at the Princeton site as we waited for the bonfire to be lit. It, too, burst alive and we cheered. A few of the faculty started singing and someone took my hand and we were joined into big circle around the fire. Gradually everyone joined in singing. The bonfire’s reflections helped me see each face—here were the families I would soon get to know in the coming year. The longest day of sunlight had been capped off with the fire of wood and community, but I would remember it for something more ethereal, more spiritual. As the fire diminished, I glanced over to the meadow at the far side of the campus. I could see something twinkling. I suddenly recognized something else from my New England childhood. Could that really be a firefly? I hadn’t seen any in decades. We left the bonfire site and moved down the path toward the meadow. This indeed was a lone firefly, but not for long. There were more lights twinkling—soon it seemed the whole meadow was alive. My daughter, even at age 13, was entranced—she’d never seen them before. —and held us in their light. The following is an excerpt from “St. 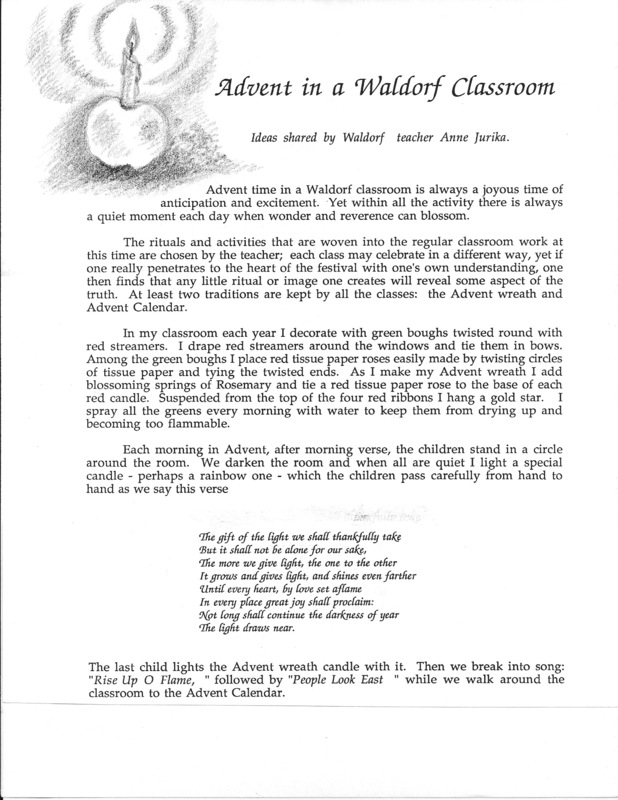 John’s Tide” written by Karen Rivers in the Celebrations and Festival section of Waldorf Education: A Family Guide. High summer has been celebrated with fire since ancient times. Huge bonfires were lit on the Summer Solstice to help the sun continue to increase rather than to diminish in the light it brings. An old custom required that people should jump over the fire to burn away their woes and weaknesses. Just after the Summer Solstice is the Festival of St. John, celebrated on June 24. 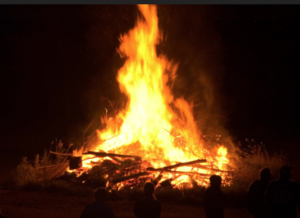 Some hold the belief that Elizabeth, John’s mother, built a large bonfire to notify her cousin, Mary, of the birth of her child, that she might come to share in her joy. Since many customs of the Summer Solstice festivals blended with aspects of St. John’s life, the two festivals have become interwoven in many regions of the world. From now until the Winter Solstice in December, the sunlight will be diminishing…. On this day, when the sun is at its height, we may turn our eye inward with the conviction that in times of abundance, the need for inner strength is just as great as in times of little light or in complete darkness. It’s not often the Boston Globe has a column about one’s hometown—these correspondents featured it the travel section—yes, it’s a gem of a 340+ year-old town. 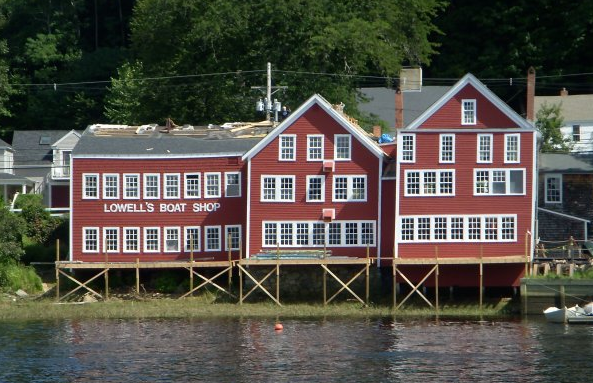 Located on the banks of the Merrimack River, Lowell’s Boat Shop is a National Historic Landmark. Unless you’ve gone careening down the famously steep, snowy hills of Amesbury Sports Park, you might have missed Amesbury completely. 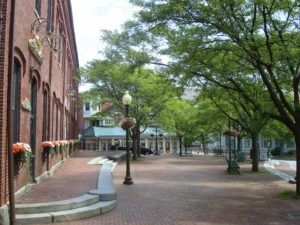 That’s OK; this city of 16,000 on the northerly edge of Massachusetts is used to being overshadowed by its more showy neighbors, Portsmouth, N.H., and Newburyport. So you’ll feel like you’ve stumbled upon something unexpectedly cool as you dig into the blue corn-fried chicken at Crave Brasserie, or set the kids loose on the pony swings at Cider Hill Farm. Amesbury doesn’t sit on the coastline, but two rivers wind through the city, the Merrimack and the Powwow. The Powwow’s 90-foot drop powered the mills that shaped the city’s history. Downtown’s brick mill buildings housed carriage makers from the 1830s to the early 1900s and, later, Merrimac Hat Factory, the largest producer of high-fashion headgear in the country in 1946. Now, the mill buildings are being revitalized to house shops, art studios, and small businesses. Located just off 1-95 north on exit 58B, the Fairfield Inn (35 Clarks Road, 978-388-3400, www.marriott.com/mhtfa, from $139), offers 105 bright and modern guest rooms, with pillow-top mattresses and 32-inch flat-screen TVs. Freebies include a “deluxe” continental breakfast and Wi-Fi; there’s also an outdoor pool. If you’re looking for something more intimate, check out the bed-and-breakfasts in Newburyport. The Compass Rose Inn (5½ Center St., 978-423-5914;www.compassrosenewburyport.com; summer rates from $225), located on a side street downtown, garners rave reviews. With five three-bedroom suites, this elegant Federalist-style (new, but made to look old) B&B offers niceties like Molton Brown toiletries and heated towel racks. Another Newburyport favorite: the Garrison Inn (11 Brown Square, 978-499-8500, www.garrisoninn.com, from $190; two-night minimum on weekends, June-Oct.), a 24-room boutique hotel set in a four-story Georgian-style building. Amenities include a complimentary breakfast and afternoon tea service. Set in an old train station, Crave Brasserie & Wine Bar (32 Elm St., 978-834-6075, www.cravefoodandwine.com, $17 and up) is Amesbury’s go-to spot for a good meal. While the menu reads like a mash-up of food trends — chipotle shrimp and gnocchi, Korean BBQ, lobster mac, fried chicken and waffles — you’ll be besotted once you taste the popovers with cinnamon butter. If the blue corn-fried chicken is available when you visit, get it. Tiny Phat Cats Bistro 65A Market St., 978-388-2777,www.phatcatsbistro.com, entrees from $12) puts a fresh, local spin on comfort food. The multi-grain risotto comes with organic tofu as an optional add-in, and the New England haddock potato cake is made with local fish (plus a tasty cilantro cumin crème for dipping). And even though the Flatbread Company (5 Market Square, 978-834-9800, www.flatbreadcompany.com, large flatbreads, $13.75-$18.75) is part of a small chain, this was the original location. Skip dessert and dig into the sea salt dark chocolate caramels at Ovedia Artisan Chocolates (36 Main St., 978-388-7700, www.ovedia.com). Owner Barbara Vogel’s charming shop is the place to go for two of the four basic food groups: handmade chocolates and espresso. On a beautiful day, meander the Riverwalk, a 1.3-mile multi-use path that skirts the Powwow along the old Boston & Maine rail bed. Amesbury’s signature attraction is Lowell’s Boat Shop (459 Main St., 978-834-0050, www.lowellsboatshop.com). Explore centuries of wooden boat-building history at this National Historic Landmark, located on the banks of the Merrimack. It’s a working boat shop (since 1793) and a living museum, with guided tours and exhibits. 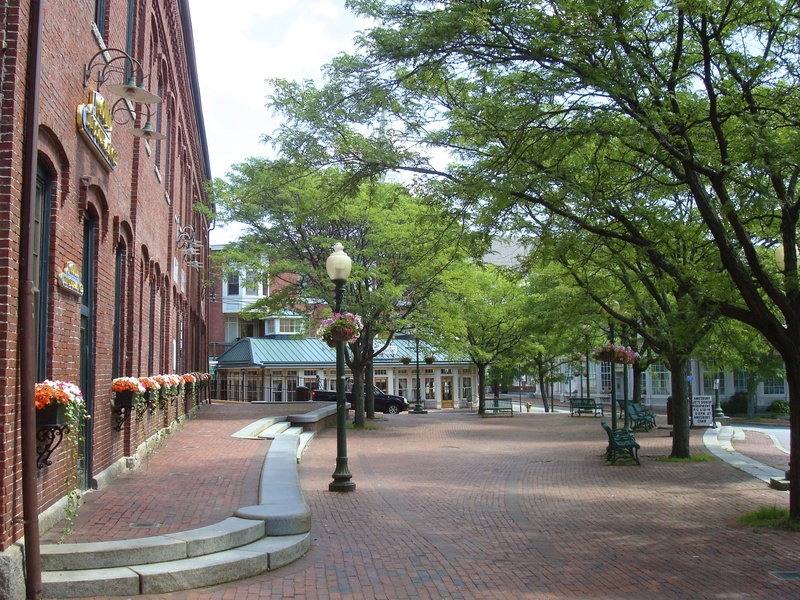 The city is also home to a couple of small museums, the Whittier Home Association (86 Friend St., 978-388-1337, www.amesburytreasures.org, $7), former home of Quaker poet and abolitionist John Greenleaf Whittier, and the Bartlett Museum (270 Main St., 978-388-4528, www.bartlettmuseum.org), a two-room museum that houses the city’s artifacts from centuries past. And if you love Amesbury Sports Park (12 South Hunt Road, 978-388-5788, www.amesburysportspark.net, two hours of summer tubing $14, Zorb ride $20) in wintertime, you’ll be happy to know it’s open for summer tubing and Zorb rides. Since you’re not traveling far, you can take advantage of Amesbury’s best stop for a souvenir, Cider Hill Farm (45 Fern Ave., 978-388-5525, www.ciderhill.com). You can pick your own blueberries, strawberries, raspberries, apples, and peaches at this 145-acre farm, or buy them by the pound, along with goodies like apple cider doughnuts. (Check the website for harvest information.) And if you have kids, check out the pony swings, made from old tires. Nothing says retro fun like candlepin bowling. Local favorite Leo’s Super Bowl (84 Haverhill Road, 978-388-2010, www.leossuperbowl.com) goes cosmic on Friday nights (from 9-11), when black lights, strobes, disco balls, and dance music amp up the atmosphere. On Saturdays from 7-11 p.m., they switch on the blue lights and queue up the oldies tunes for “Moonlight Oldies” night. Get your game on at the Riverside Lounge (37 Main St., 978-834-0020, www.riversideloungebar.com) where 18 TV screens and 17 draft beers make it a party. Just down the street, there’s the Ale House (33 Main St., 978-399-1950, www.amesburyalehouse.com), where they’ve got 24 brews on tap. And we’d lose all street cred if we didn’t mention Hodgie’s Ice Cream (71 Haverhill Road, 978-388-1211, www.hodgies.com), open till 9 p.m. This throwback ice cream stand draws crowds for massive, made-on-site ice cream — and even the small servings are enormous. Amesbury is 52 miles north of Boston. 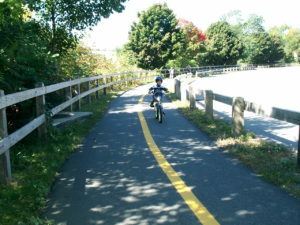 For information, visit www.amesburychamber.com. When I left New Jersey, leaving behind my work as the Director of Community Development at the Princeton Waldorf School in 1995, I didn’t know that when I settled in my hometown in northeast Massachusetts, I would learn of a group trying to start a Waldorf school in Portsmouth, NH. No sooner did I restart my publishing company, I joined the group of five, two of whom were starting their Waldorf teacher education program through Antioch New England in Keene, NH. As one can imagine, starting a school is arduous, and without going into details of this pioneering effort in today’s blog, the group succeeded and a few years later we opened Tidewater School across the river from Portsmouth in Eliot, Maine with a Kindergarten and Grade 1. Even with its enormous challenges, it grew and is now a Developing School of the Association of Waldorf Schools of North America (AWSNA). The site always had its challenges—and even with amazing transformations thanks to the parents with carpentry skills, lazuring parties and countless Open Houses—we hoped to expand our small site to a full-fledged Pre-k to Grade 8 school. We didn’t know if it would develop to its fullest at this site or somewhere else. During that exciting opening day’s ceremony, I felt it a special privilege to tell the children and parents the story of the opening of the first Waldorf School. I stayed on the Board of Directors for five years and since then, have joined the community periodically for May Faires, special events, fund raisers and other celebrations. Over the years, the school developed up to Grade 6 with small classes and then lost a few grades and had to regroup. This past year it had several Pre-K classes, Kindergarten and a Grade 1/2. The enrollment is strong for September. Today marked the closing of Tidewater Waldorf School. 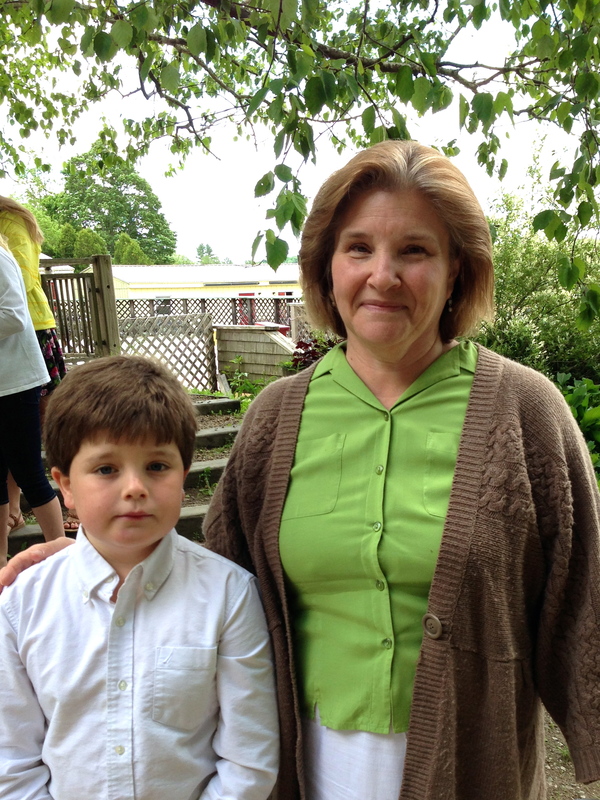 In September it will open as Seacoast Waldorf School—a new name and at a new site. One other founding Board member and two founding parents were able to join me today at Tidewater’s closing ceremony. Grade 1/2 children formed an arch with arms stretched upward while the children of the new Grade 1 class came through—all being met with applause from teachers, parents, and guests. Each child in the new Grade 1 class marched one-by-one under the arch of arms wearing a birthday gold felt crown and a gold silk piece of fabric around the shoulders. It was if their gold silks matched the exuberance and brilliance of today’s morning sunshine. Everyone moved to a grassy area while classes recited poems, the community sang the official “Tidewater Song” and thanks were extended to the founding Board members and parents, the present faculty and the whole community. The ceremony closed with announcements about the move shortly to the new site up the road, followed by fresh strawberries and ice cream for everyone! It was both a poignant and joyful day. As expected, many adults took photos and offered lots of congratulations as well as good-byes. I hadn’t seen one of the founders in ten years and we reflected on our experiences—exhausting and exhilarating—getting the site ready right up to midnight, just hours before the opening day so long ago. We both were so pleased the school had purchased another site and for a reduced price during a foreclosure sale this spring. It is in excellent condition and has so many amenities our original site lacked. At the same time, we acknowledged the mixed feelings knowing that the building on Tidewater’s original site would probably be razed by a new owner. During my 28+ years in Waldorf Education, I often heard that Rudolf Steiner had asked this of the children when he periodically visited the first Waldorf school. Today, as I left after the closing ceremony, I received one boy’s answer to that question.